When assessing an AdWords account for the first time, it is important to look at the vital statistics, cost-per-action (CPA), budget, and ROI. Analysis of the general account structure should also be carried out. (How campaigns and ad groups are segmented, and the keyword match types that the campaign or ad group is built around.) Results will always vary: some accounts will require a total restructure, while others might just need a general clean up or change in budget allocation. However, we have found that ad extensions are often overlooked by most agencies and in-house teams. They are either completely neglected, or used sporadically throughout the account and lack any discernible structure. So what is an ad extension? Location extensions – Gives directions to the closest store or office using your My Business profile, and matches your closest location to the searcher. Call extensions – This shows the phone number of the business and utilises a click-to-call button on mobiles, allowing searchers to call you instantly. 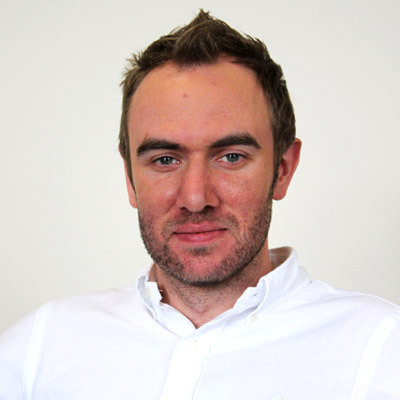 Site link extensions – Displays links to other parts of your website under your regular ad copy. Up to four site links can be shown at once. Review extensions – A reference from a third party review, this must be from the past year and from a reputable source. Callout extensions – An additional line to your ad copy that bullet points your business’s USPs. App extensions – A prompt to download your app (only available on mobile and tablet). Social extensions – Shows your business’s Google+ followers (your follower count must exceed 100 and your URL must be verified). Seller ratings – Star ratings are displayed as an extension based on third-party seller-review sites. They require you to have at least 30 unique reviews over the past 12 months and your rating must be above 3.5/5. Dynamic structured snippets – Additional information taken from the content on your website, to help people find out more about your business. You might be surprised to learn that there is no extra cost associated with ad extensions. You still pay your regular cost per click if someone clicks on your ad extension — whether this is a click-to-call, directions to your store, or an app download. Of course, every business is different and some of these ad extensions might not be applicable to you. For instance, if you own a local restaurant you probably won’t have a mobile app. However, location extensions and call extensions are essential for customers to find your business. The type of ad extensions that show will depend on your ad rank. As you might expect, the higher your ad rank the more likely your ad extentions will appear. Another infuential factor is branded keywords. These are likely to have a high ad rank, and will therefore show the ad extensions that have been set up for that campaign or ad group. 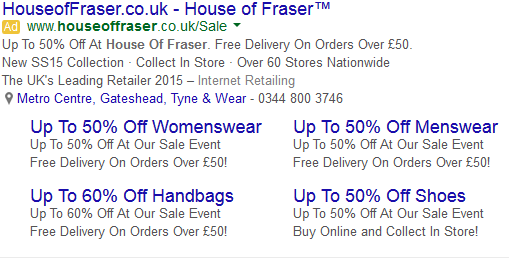 From the image above you can see that House of Fraser more than trebles the size of their ads when searching for their own brand. They do this by using a full range of managed ad extensions. This creates powerful branding effect and a more appealing and noticeable ad. When the results are displayed you are probably drawn to the second result: Softlayer.com, which uses a range of extensions. 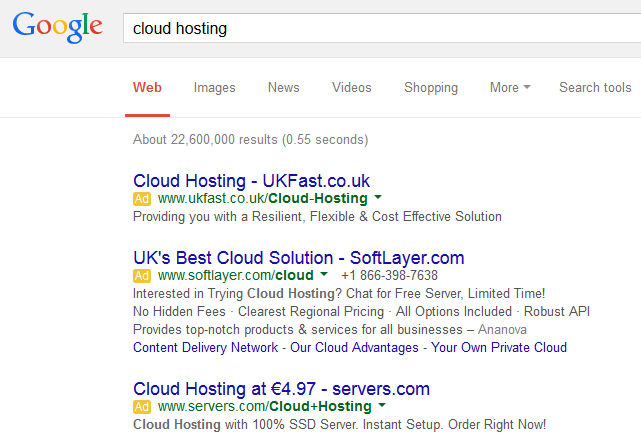 Although ukfast.com is in top position, it can easily be overlooked in favour of the more prominent ad from Softlayer. To learn more about ad extensions, or to find out how you can be doing more to stand out from your competitors, contact us, or call 0333 7000 555 for your free PPC audit.